June 27, 2007: Sometimes you can't believe your eyes. This weekend is one of those times. On Saturday night, June 30th, step outside at sunset and look around. You'll see a giant moon rising in the east. It looks like Earth's moon with the usual craters and seas, but something's wrong. This full moon is strangely inflated. It's huge! Sky watchers have known for thousands of years that low-hanging moons look unnaturally big. Cameras don't see it, but human eyes do; it's a genuine illusion. This weekend's full moon hangs lower in the sky than any other full moon of 2007, so the Moon Illusion is going to be strong. What makes the moon so low? Consider the following: The sun and full moon lie on opposite sides of the sky. They are like a see-saw: when one is high, the other is low. Because the summer solstice was just last week (June 21st), the sun is near its highest point in northern skies. The full moon is correspondingly low. When you look at the moon, rays of moonlight converge and form an image about 0.15 mm wide in the back of your eye. High moons and low moons make the same sized spot. So why does your brain think one is bigger than the other? After all these years, scientists still aren't sure of the answer. A similar illusion was discovered in 1913 by Mario Ponzo, who drew two identical bars across a pair of converging lines, like the railroad tracks pictured right. The upper yellow bar looks wider because it spans a greater apparent distance between the rails. This is the "Ponzo Illusion." But there's a problem: Airline pilots flying at very high altitudes sometimes experience the Moon Illusion without any objects in the foreground. What tricks their eyes? Maybe it's the shape of the sky. Humans perceive the sky as a flattened dome, with the zenith nearby and the horizon far away. It makes sense; birds flying overhead are closer than birds on the horizon. When the moon is near the horizon, your brain, trained by watching birds (and clouds and airplanes), miscalculates the moon's true distance and size. from the US Naval Observatory. 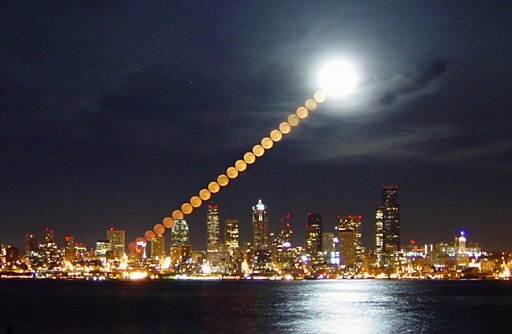 The Moon Illusion Explained -- According to Don McCready, a Professor Emeritus of Psychology at the University of Wisconsin, the Moon Illusion is caused by oculomotor micropsia/macropsia.